Update: December 2018 – Above link is no longer accessible after US intelligence agencies blamed the DCLeaks on Russia. US servers are making it inaccessible. One of the key emails on Ukraine that shows Soros collusion with specific on board media outlets including the Guardian and the Huffington Post. These are from the official DCLeaks Soros files on Ukraine. This is just one of the 370 emails on Ukraine. Keep in mind that Soros invested over $1 billion into the country along with investment group Franklin Templeton who were invested for $8 billion also right before the coup. These blood money investments pay huge once the IMF starts to allocate funds for the targeted country and pumps 1 of every 4 dollars into Privat Bank owned by Ukrainian oligarch Igor Kolomoisky who finances and controls the Right Sector Nazis that overthrew the government. Then the peoples state assets were confiscated and sold off to pay off the IMF and the oligarchs that brought the coup in the first place. Its all a nice little blood money scam with ole Georgie Boy, Franklin Templeton, the Blackstone Group and their Geneva friends like Christine Lagarde of the IMF supplying the front while EU stooges fronting NATO like Anders Fogh Rasmussen and Carl Bildt provide the protection while robbing the tax payers of their hard earned money to fund it all and transition the money through the whole target country laundry cycle and into their own bank accounts. The emergence of a New Ukraine carries with it the opportunity to reinvigorate the European project and reaffirm its ideals of union, solidarity, democracy, and peace. A strong, successful Ukraine protects against a democratic backslide in the east of the continent. However, this is complicated by the reluctance of some EU actors to accept the Maidan revolution as democratic and the Ukrainian government as legitimate. These actors have their own agendas -related to geopolitical and economic considerations with Russia – and will therefore be difficult to influence. But for other groups and individuals, on the political left and across various social movements, one can detect confusion regarding the state of affairs in Ukraine. This has been fueled by a combination of ignorance about the facts on the ground, Russian propaganda, incoherent information by the Ukrainian government, and anti-American sentiment. This second group of actors includes key opinion-makers, some traditional mainstream players (such as trade unions and some political parties), emerging groups that are re-shaping Europe’s political map (in particular in southern Europe with M5S in Italy, Podemos in Spain, Syriza in Greece), and a wide range of liberal NGOs in western Europe. · To stimulate debate and doubt in those democratic left movements, parties and audiences of Western Europe where a negative perception of the transformation of Ukraine is hegemonic, or very preponderant. · To discredit the idea that the independence and integrity of Ukraine is an ideological cause of the Right. · To influence the way information about Ukraine is heard and perceived in Southern Europe, especially among the group of doubters (see above). Specifically, we would like to facilitate the exchange of information with a skeptical or cautious European audience to show the degree of debate within Ukraine about its current reforms and that there are different visions for the future of Ukraine. 1. Media impact: Greater presence of voices from Ukraine’s civil society in left leaning and alternative press. More direct reporting by Ukrainian journalists on the ground facilitated by translating articles and also from OSF journalist-fellows inside Ukraine. 2. Left-wing “pro-Maidan” opinion formers’ voices amplified in the debate on Ukraine, e.g. organize a conference on the New Ukraine in partnership with the political science/international affairs department in the leading universities in each of Germany, France, Spain, Italy and Greece. These conferences to include a variety of voices from the new Ukraine. 3. Stronger grassroots-to-grassroots and CSO-to-CSO networks fostered between European and Ukraine civil society through activist exchange workshops; greater understanding of the complexities of Ukraine’s current political transition by EU actors and more nuanced appreciation of European perspectives by their counterparts in Ukraine. 4. Russia’s line on Ukraine will be subjected to a greater degree of scrutiny and skepticism by the left-wing actors involved in this project, relating to the European anti-fascist movement will be a key entry point in this debate. Media: Build on existing relationships, for example with the Guardian to increase coverage of voices from the New Ukraine – e.g. Maidan: One year on. Work with the alternative press (e.g. Eurozine, Huffington Post, Street Press, Internazionale) as key influencers for the audience we are targeting, for example by funding translations of articles by Ukrainian journalists. Set up a CSO coalition Friends of Maidan who will engage in informal and regular advocacy about the situation in Ukraine in their respective countries and expose potential allies to diverse views on Ukraine. Output: Coalitions in the five target research countries and one EU level aimed at GUE/NGL groups. Soros finances humanitarian organizations while at the same he finances propaganda campaigns that promote and lead to coups and war. The manipulation of a simple photo by the Soros funded Human Rights Watch highlights the point. The original picture was taken on the day of the Odessa Massacre in May 2014, a horrific event where 45 ethnic Russian protesters were burned to death by the Right Sector who arrived by buses and trains from Kiev. 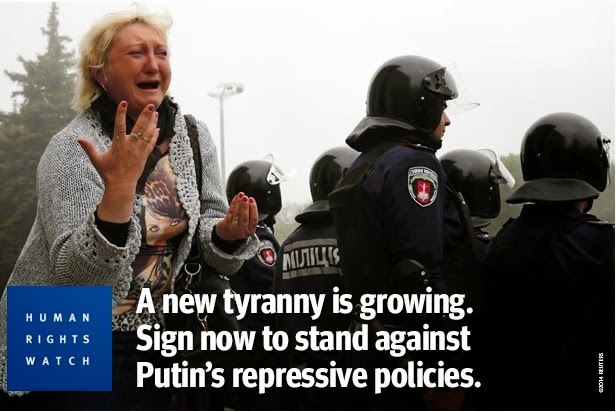 Yet, the Soros funded HRW used the very same pic in an anti-Russian campaign and even Tweeted it on their Twitter feed. Finnish researcher Petri Krohn archived the shots at his “Closer Look on Syria” website. Unknown hackers hacked into the database of the Soros Foundation and posted more than 2500 files of the organization on the Internet. The documents published on the website DCLeaks.com cover the period from 2008 to 2016 and related to different aspects of the activity of the billionaires organisation. Ukraine is also mention in the papers of the organisation, and quite frequently – 370 times. Among the files there are documents concerning the organisation of Euromaidan, a shorthand report of activist meetings with the representatives of the “Resurrection” Fund and US ambassador Geoffrey Pyatt, as well as materials about a planned George Soros meeting with the leader of “Svoboda” Oleg Tyahnybok and others. It “unexpectedly” turns out that the insinuation of “Kremlin Propaganda”, that Euromaidan was not a spontaneous release of the people to the streets in a uniform rush, but was directed by western organizations, is at least partly confirmed. Many documents concern the delivery of grants to the Ukrainian mass media, organizations, and certain journalists. For example, in one document it is proposed to allocate $500,000 a year for “technical assistance” to such media as the TV channel Hromadske and websites such as “Crimea, Realities and Ostrov”. Much more at link above…. A Ukrainian hacker group claim to have emails that implicate billionaire George Soros in attempting to get involved in the conflict between Ukraine and Russia over the past year. Soros allegedly says that America should provide military hardware to Ukraine and try to adjust the perception of financial stability in the region. Alexey Yaroshevsky has more from New York City. The files are grouped into sections such as geographical region, the World Bank and the President’s Office, and cover the period from 2008 up until 2016, according to The Daily Caller. They reveal work plans, strategies, priorities and other activities by Soros, and include reports on European elections, migration and asylum in Europe. DC Leaks claims to be the work of American activists who want to present the truth about the “US decision-making process as well as about the key elements of American political life.” US security experts however are blaming the leak on Russian hackers, according to Bloomberg, in a similar reaction seen in the wake of the DNC leaks. George Soros is a Hungarian-American business magnate, investor, philanthropist, political activist and author who is of Hungarian-Jewish ancestry and holds dual citizenship. He drives more than 50 global and regional programs and foundations. Soros is named an architect and a sponsor of almost every revolution and coup around the world for the last 25 years. The USA is thought to be a vampire due to him and his puppets, not a lighthouse of freedom and democracy. His minions spill blood of millions and millions of people just to make him even more rich. Soros is an oligarch sponsoring the Democratic party, Hillary Clinton, hundreds of politicians all over the world. This website is designed to let everyone inside George Soros’ Open Society Foundation and related organisations. We present you the workplans, strategies, priorities and other activities of Soros. These documents shed light on one of the most influential network operating worldwide. An email leaked by WikiLeaks reveals that when Hillary Clinton was US secretary of state in 2011, billionaire George Soros instructed her on how to handle unrest in Albania, stressing it “needs urgent attention at senior levels of the US government.” “Dear Hillary,” begins the email dated January 24, 2011 from the founder of Open Society Foundations, Soros. “A serious situation has arisen in Albania which needs urgent attention at senior levels of the US government. You may know that an opposition demonstration in Tirana on Friday resulted in the deaths of three people and the destruction of property,” Soros says, according to the leaked email. Soros suggested three candidates: Carl Bildt, Martti Ahtisaari, and Miroslav Lajcak, saying all “have strong connections to the Balkans.” “The US and the EU must work in complete harmony over this, but given Albania’s European aspirations the EU must take the lead,” he stressed, adding that his foundation in Tirana was “monitoring the situation closely and can provide independent analysis of the crisis.” Several days after the email was sent to Clinton, the EU did send one of Soros’ suggested nominees, Miroslav Lajcak, to meet Albanian leaders in Tirana to try to mediate an end to the unrest, Reuters reported. Good video that lays it all out quite well regarding Clinton, Soros, Libya, Ukraine, Syria, Albania. Caveat: Can’t say I agree with all the views of this poster, but in this video he does lay out quite well the email connections between Soros and Clinton and to their wars/overthrows. I believe that if we want to reveal the crimes and lies of the Deep State that we have to come together and put our political subservience to the wayside. Keep clearly in mind that when Soros says ‘Open” he means open to pillage and rob from. The ruse works in that he pays off the politicians and media outlets that kindle the fire. While this is taking place he’s making ‘investments’. Then when it all goes down he can quickly recoup on the initial investment and control the key players within the target country in order to asset strip the country of the peoples hard earned valuable infrastructure through cronies. The IMF works in a very similar manner. Franklin Templeton group also seems to have worked in conjunction with Soros when it came to the initial investment before the Ukraine coup. John Helmer covered much of the IMF aspect with Naked Capitalism back in March 2015 when the loans for Ukraine were coming due and being exposed more fully. Ukraine‘s hope of reaching a compromise with its international creditors hangs in the balance as the two sides prepare for complex negotiations to begin this month. While Kiev has been open about its plan to impose a haircut on billions of dollars of public debt, investors are expected to resist losses. A committee of foreign bondholders who account for more than half of the country’s external debt, including Franklin Templeton, has already been set up and is being led by Blackstone’s advisory arm. This group could block proposals relating to bonds they hold, as could Russia which holds one bond in full. However, academics say Ukraine is not necessarily out of options if this occurs. Governments in the past have found that looking within the machinery of their bonds can sometimes strengthen their hand. The question then is whether this risks the country’s deal with the IMF, which has a rule about not lending to countries that miss payments to other governments. Fund officials suggest the IMF might tweak its own rules to get around the situation but academics say another option might be for Ukraine to make Russia’s debt unenforceable in English courts, arguing that Russia’s annexation of Crimea should be set off against the debt. My theory is that those cronies are primarily Switzerland and London based such as Ukrainian oligarch Igor Kolomoisky who controls Ukraine’s Privat Bank, the Right Sector battalions, employs Joe Bidens son and is the head of the European Jewish Congress. Hence the reason no government is going after Kolomoisky for his theft of $1.8 billion in IMF funds as reported by Andrew Cockburn in Harpers in summer 2015. See ….when your one of the global elite, you get a free pass. I do think they are trying to divide and conquer the American people and by inflaming internal conflict in the US the global elite who run the US Deep State are attempting to avoid responsibility for their large scale crimes. The purple color theme was quite obvious after the election but now they have seemed to quiet it down somewhat as many people were calling it out, myself included. In the following posts are numerous examples of Soros’ hand operating behind the scenes regarding recent events in the US and Syria. As one might suspect, despite its constant rhetoric regarding “human rights,” “freedom,” and “democracy,” Avaaz has openly supported violence, war, and imperialism. In 2011, Avaaz raised its voice as loudly as it could with demands that the EU, NATO, UN, and all other parties “stop the violent crackdown” on civilians in Libya. Translated: Avaaz called on the EU, NATO, UN, and all other parties to come to the rescue of jihadists that had been unleashed against the government and the people of Libya in order to overthrow Ghaddafi for the benefit of the NATO powers. Avaaz soon after turned its sights on Syria, the next country in line to suffer under NATO’s attempt to destroy an uncooperative national government. As a sampling of the drivel Avaaz regularly released regarding Syria, Avaaz posted on its website the following transparent propaganda in an attempt to drum up support for a No Fly Zone in Syria.